A radioactive mineral and the most important source of uranium. Uraninite Crystals collected from the Trebilcock Pit near Topsham, Maine. The specimen measures approximately 2.7 x 2.4 x 1.4 centimeters. Specimen and photo by Arkenstone / www.iRocks.com. Uraninite is a uranium oxide mineral and the most important ore of uranium. It received its name from its uranium content. Uraninite is highly radioactive and should be handled and stored with care. 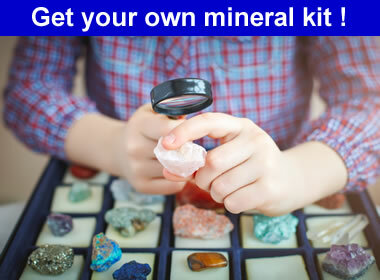 It is not a suitable mineral for classroom use. 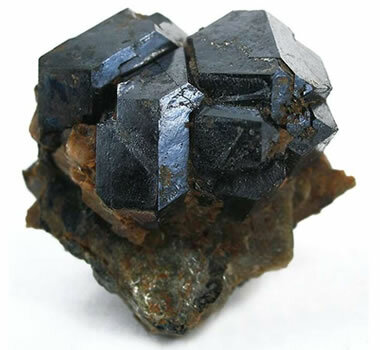 Uraninite has an ideal chemical composition of UO2, but the mineralogical and chemical composition of specimens varies in response to their levels of oxidation and radioactive decay. “Pitchblende” is an archaic name that was used for uraninite and other black materials with a very high specific gravity into the late 1800s and early 1900s. Color Usually gray to black, sometimes brown or greenish. Streak Brownish black, black, gray, greenish. Luster Submetallic, greasy, or dull. Diaphaneity Opaque, translucent to transparent on thin edges. Specific Gravity The ideal specific gravity is between 10 and 11. Oxidation and radioactive decay will alter the mineralogical composition and can reduce the specific gravity to as low as 6.5. Diagnostic Properties Radioactivity, color, luster, specific gravity, lack of cleavage, crystal form / habit, yellow oxidation products. Uses The primary ore of uranium. Well-formed crystals of uraninite are extremely rare. When found they are usually cubes, octahedrons and modified forms. 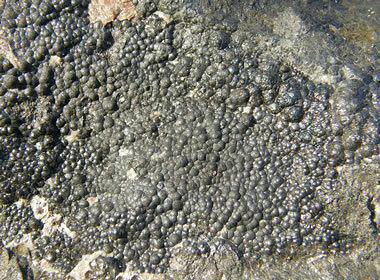 Uraninite more often occurs as a botryoidal or granular crust on other materials. Uraninite has a very high specific gravity. Unaltered specimens can have a specific gravity as high as 11. Specimens that have advanced stages of weathering or radioactive decay can have a specific gravity as low as 6.5. Two properties of uraninite are useful for locating it in the field. These are its radioactivity and its tendency to weather into yellow oxidation products. A radiation detector can be used to quickly scan core, rock and soil for radioactive materials. Yellow materials can be false indicators, but if they are oxidation products of uraninite they will usually be radioactive. Uraninite has a complex chemical and mineralogical composition. Because of its radioactivity, the uranium in its composition is in a constant state of decay, and those decay products are also in a constant state of decay. Uraninite is also subject to oxidation, and the alteration products are numerous oxides and hydrates. In addition to uranium and oxygen, most specimens of uraninite contain varying amounts of several materials. These might include argon, cerium, helium, lead, nitrogen, radium, thorium, yttrium and more. As a matter of trivia, the first helium discovered on Earth was found in a material known as “cleveite,” an impure variety of uraninite. Helium is a product of the alpha decay of the uranium in uraninite. Gummite is a yellow oxidation product of uraninite. It consists of uranium oxides, silicates and hydrates. Its yellow color is often an indication that uranium minerals are nearby. This specimen consists of a mixture of gummite (yellow), uraninite (black), and zircon (brown). It measures approximately 8.7 x 7.1 x 2.0 centimeters and is from the Ruggles Mine in Grafton County, New Hampshire. Specimen and photo by Arkenstone / www.iRocks.com. When uraninite is found in surface or near-surface deposits, it may have been subjected to weathering. A yellow weathering product known as gummite is often present. Gummite is a mixture of uranium oxides, silicates and hydrates derived from oxidation and other weathering processes. 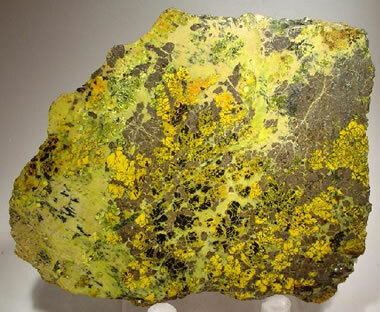 Geologists searching for uranium minerals in near-surface rocks are always alert for yellow, yellowish orange and yellowish green colors that might indicate the presence of uraninite oxidation and gummite. Botryoidal Uraninite crust from the Niederschlema-Alberoda deposit, Saxony, Germany. Scale unspecified. Photo by Geomartin, used here under a GNU Free Documentation License. Uraninite occurs as a primary mineral in granitic and syenitic pegmatites. Well-formed crystals are rare but cubes, octahedrons and modified forms occur. Uraninite is also found as a high-temperature precipitate in hydrothermal veins, often as a crust exhibiting a botryoidal or granular habit. Uraninite is also found in sedimentary rocks. It occurs as heavy detrital grains in coarse sandstones, conglomerates, and breccia. Small amounts of uraninite are sometimes associated with organic material in sedimentary deposits. These have often weathered into secondary uranium minerals. Significant deposits of uraninite have been worked in the Democratic Republic of the Congo; Saskatchewan, Canada; Northwest Territories, Canada; Ontario, Canada; and Utah, United States. Deposits of note also occur in Australia, Austria, Czech Republic, England, Germany, Hungary, Namibia, Norway, Rwanda, and South Africa. In the United States uraninite deposits have been found in Arizona, Colorado, Connecticut, Maine, New Hampshire, New Mexico, North Carolina, Texas, and Wyoming. 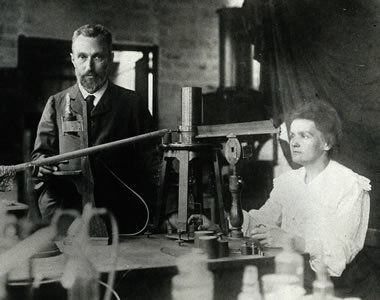 Pierre and Marie Curie in their laboratory circa 1904. Public domain photograph from the Nuclear Physics Institute of the Czech Academy of Sciences. Uraninite has played an important role in the investigation of radioactivity. Chemists and physicists of the 1700s and 1800s were busy investigating “pitchblende,” the name used at that time for uraninite and other black minerals with a high specific gravity. In 1789, Martin Heinrich Klaproth, a German chemist, was studying pitchblende when he discovered uranium. He later determined that uranium was a distinct element, although he was unable to isolate uranium into its pure metallic state. Marie Sklodowska Curie, a Polish, naturalized-French, physicist and chemist, was studying pitchblende in the late 1890s and early 1900s with her husband, French physicist Pierre Curie. Their work led to the discovery and first isolation of radium and polonium. They coined the term “radioactivity,” and their work led to the development of the theory of radioactivity.